Tim is a senior at a local high school. He went through driver’s education as a junior, and since receiving his license, he has been working at a fast-food restaurant to make some much-needed cash for himself and his family. While he has a perfect driving record, one day he receives a notice that his driver’s license has been suspended because he has missed too many days of school. Needing the money from his job and lacking the savings to pay the fine to get his license back, he continues driving anyway. On his way to work he gets pulled over for speeding and now what was just a fine has turned into a much larger problem. Although Tim’s case is just a hypothetical example, stories like this are common across North America. License suspensions for non-highway-safety-related offenses—which can include truancy, school performance, drug possession and failure to pay child support or other debts—account for 39 percent of all suspensions and 75 percent of those suspended drivers continue driving anyway. Any person can fall into a similar pattern, however, license suspension for non-highway-safety-related offenses has a particularly negative effect on young people, especially those who are low-income or minorities. 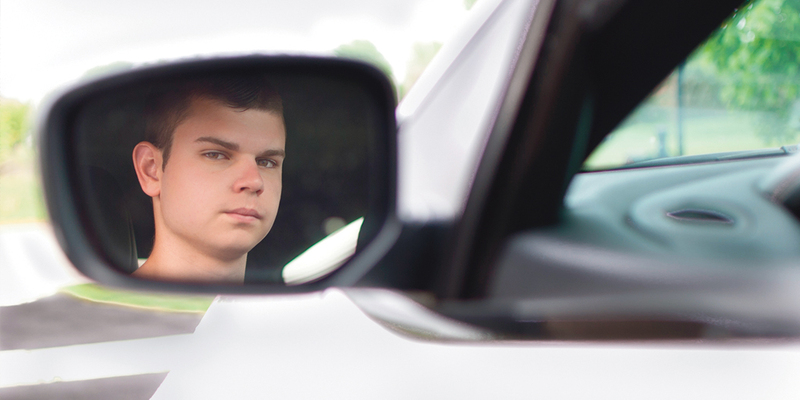 As part of the Working Group, Rai helped put together a recently-released AAMVA Best Practices guide, Reducing Suspended Drivers and Alternative Reinstatement, which updates a previous 2013 guide and adds a new focus on the experiences of young drivers. Rai explains that license suspension issues can end up pushing young people to more extreme situations. Kurt Myers, Deputy Secretary of the Pennsylvania Department of Transportation for the past 12 years and a former Chair of the AAMVA Board of Directors, has seen this problem affect young people in his jurisdiction firsthand. In Pennsylvania, Myers has been part of multiagency effort to eliminate a number of non-highway-safety-related license suspension offenses. Pennsylvania General Assembly 2018 Act 95, which was signed into law in October 2018, ends license suspensions for offenses including: sale of tobacco to a minor; misrepresentation of age; purchase, consumption, or transportation of liquor by an individual under age 21; and simple possession and possession with intent to deliver, among others. Myers explains that getting to this point required interest and cooperation from many Pennsylvania agencies, including top Pennsylvania policymakers. He says that the 2013 release of AAMVA’s Best Practices Guide to Reducing Suspended Drivers also helped to bring the issue to the forefront and provided necessary background on the topic. When making the case for Act 95, Myers found that there were two main arguments. 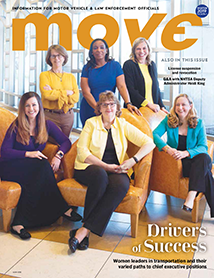 When Act 95 goes into effect later this year, Myers expects to see improvements in suspension issues for drivers and savings across many state agencies. Spencer R. Moore, Commissioner of the Georgia Department of Driver Services (DDS), saw a similar act passed in his jurisdiction—Senate Bill 100, which was passed on July 1, 2015—and the impact was staggering. 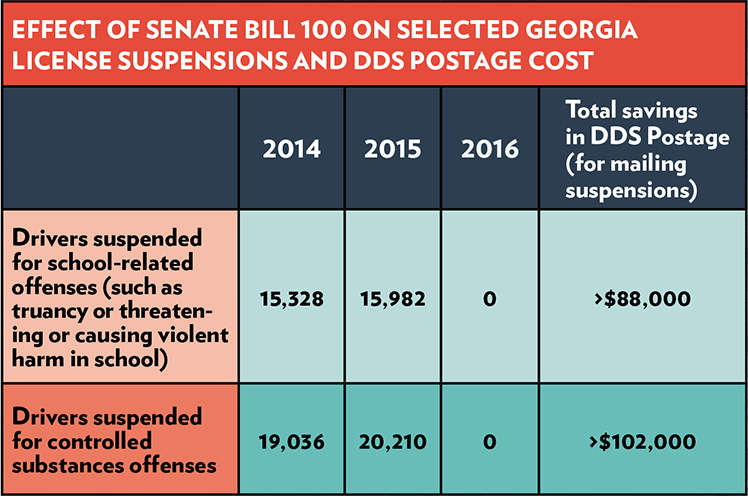 Moore explains that in the first year the act was in effect, the Georgia DDS saved almost $200,000 solely in postage on just two categories of license suspensions: school-related and controlled substance-related suspensions. Beyond the financial impact of reducing non-highway-safety-related license suspensions, Moore, like Myers, sees the impact to Georgia citizens as just as, if not more, important as the money saved. In addition to doing this through legislation, the Georgia DDS has also partnered with the Georgia Department of Corrections on driver’s license reinstatement programs that proactively help eligible offenders get licenses or identification cards so that when they are ready to get a job, they have what they need to become productive. Another example of this type of proactive action is a Pauper’s affidavit, which people who meet federal poverty guidelines in Georgia can apply for to reduce the fees they have to pay for license reinstatement. Rai also points to a prevention program in Massachusetts that targeted drivers between the ages of 15 and 24 years old for training and created an 83 percent reduction in minor traffic violations among participants over a span of three years. She says programs like this are proof that, if given the tools to succeed, most people, especially young people, will take advantage of them.